Twice a year my bees get some essential oils in their diets. The aim is for general health, to strengthen their immune systems and to combat varroa mites, from the inside. Before I go any further, let me say there is no science involved in any of this. It all makes sense to me. I take supplements; the bees take supplements. The oils I use and the amounts have been derived though researching what other beekeepers use and experiments (aka: “that seemed to work”, when all went well or “well, it seemed a good idea at the time,” when all went wrong). Until fall of 2014 I had always used cane sugar syrup to deliver the oils. The bees got their supplements in 2 ½-gallon servings of syrup delivered one to two weeks apart (however long it took them to consume the syrup). This always worried me a bit because I was adding liquid to the hive. Now, in some areas that is fine, and might even be good, but I live in the northwest corner of Washington state – land of rain. Here in Maple Falls, we can get 67 inches of rain in a “normal” year. We’ve had years where it rained for 6 weeks straight during the height of flower bloom. A friend calls the area “nosema central.” So adding water to hives that are already facing the challenge of a wet environment troubled me. Then a friend and brilliant beekeeper, Clyde Caldwell, came across some research that showed liquid feed could aid and abet nosema. Then I got really worried. In the meantime, beekeeper Stan Kolesnikov , had been having great success with bee essential oil patties. Thus the experiment began. They seem to be working. There are lots of bees about. Now, I don’t open my hives in January – it’s usually snowy and cold. Even though weather’s gone weird and I’m writing this outside on a 47F day, I still don’t want to pull the hives apart. But this odd warm weather has a lot of bees flying. A popped a few tops to peak at the top bars, and no sign of nosema, even where the bees had moved to the top boxes. On to phase two of patties over syrup: I spent part of the other day making bee goo – most people would say “patties”, but I do this in a big pot and then measure it out in the field – every hive gets 2.5 oz of goo. If I get inspired maybe I’ll make patties out of it, but I bet I won’t. The following makes 4 pounds of bee goo – which would be about 25 patties. I can easily mix 4 pounds at a time at present. I need to buy some bigger pots/bowls. 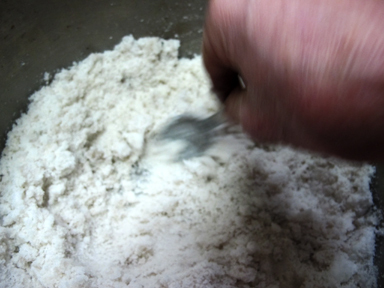 I put this through a blender – Because all my sugar has solidified into solid 50 lb blocks (such fun). It does make the sugar fluffier. I would mix with a hand blender – if I owned one. Because vinegar brings sugar closer to the pH of honey and is thus makes it easier for bees to digest the sugar. The suggested vinegar is white vinegar, but I used organic apple cider in this case – I have it on hand for the goats – that’s another non-bee story). Again basing the amount on the amount I had been using per hive in syrups. I added in Nozevit – mainly because I had tried some in the syrup in the past– it did no harm, and although tests did not impress me. It’s a smaller amount than many patty recipes, but bees don’t eat shortening, so as little as possible is good, I think. I could make little patties from this point, but I usually measure in the field. It’s a time thing. 1) I took the amount of each oil that each hive would have gotten from 1 gallon of syrup. 2) I took all the amounts of sugar and shortening (organic palm oil in this case) that were suggested for each hive by different on-line sources. Last fall I settled on the 2.5 oz/hive amount. Now it’s made and in a pot. February is just around the corner and if the temperatures stay up, I’ll go around the hives and put in the “patties”. I’ve also got about 2 gallons of crystallized honey from my hives standing by in case any of the hives are low on stores. The quick top-bar peek showed the hives had lots of honey left. But then I leave about 70 pounds of honey on my big hives and 50 pounds on my over wintering nucs each year. Because no matter how good (or bad) our bee feed is, it’s never as good as honey for the bees. That’s the news from Brookfield Farm Bees And Honey, in Maple Falls, Washington. Where I’m writing this outside at the farm! Hey, it’s usually snowing and cold right now. Today is 47F and sunny – go figure. What preparations are you all making for the coming bee season, or for shutting down hives for the coming winter – in the southern portion of our planet? Any and all suggestions about bee patties are welcome – as I say, it’s not science, just gleaned though reading what others have done, and what has worked and what has failed. This entry was posted in 1 Beekeeping, 2 Diseases/Pests/Treatments and tagged bee, Brookfield Farm, essential oil, honeybees, how to, making, Maple Falls, patties, patty, recipe, Washington. Bookmark the permalink.